This week's random butterfly needs no introduction. With a name like superba and deliciosa, who needs a common name to remember it! 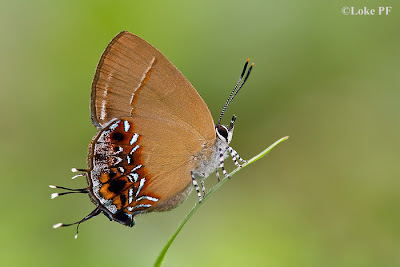 : ) This beautiful Lycaenid never fails to attract ButterflyCircle members whenever it appears. A fast-flying but small species, it is moderately rare, but has a wide distribution across parks, gardens and the nature areas in Singapore. Here, ButterflyCircle member Loke PF shot this pristine female perched elegantly on a blade of grass. Females of this species feature three pairs of tails, whilst males have only two pairs.